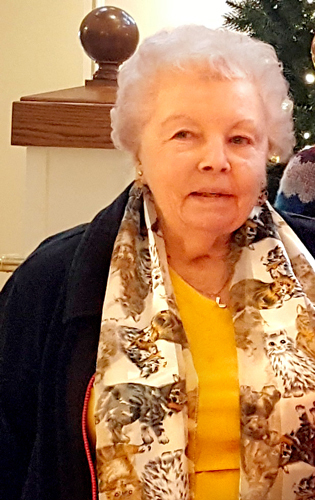 The Sisters of the Holy Names have been a part of our family since my mother, Gertrude O’Toole, attended high school at the Convent of Our Lady of the Sacred Heart at Lake Merritt, Oakland. When it was time for me to go to school, I attended Holy Names High School (HNHS), graduating in 1946. After completing my degree at San Jose State University, I received my teaching credential from Holy Names College (now Holy Names University). At HNHS, I was deeply influenced by Sister Mary Christine, my sophomore homeroom teacher, and Sister Mary Edmund, our Dean of Students. The memories of both of these Sisters and my other teachers remain with me to this day. I continue to volunteer and support HNHS by attending many HNHS events and volunteering in the Alumnae Association. My daughter, Suellen Newton Noland, graduated from HNHS in 1977. What motivates me to support the Sisters? Three generations of our family have been educated by the Sisters and their support and encouragement were influential in my life. Since 1992, I have given back to them – first “in a small way” and since 2007 through my larger gifts from my IRA. An IRA distribution to the Sisters is convenient and the tax advantage makes it a “no brainer.” I am able to increase the amount of my yearly contribution and my gross income is adjusted because of this gift. Supporting the Sisters and their ministries is my way of thanking them for the strong education I have received. Those over the age of 70½ who have not yet taken the required distribution (RMD) from their IRA might ask their IRA administrator to make a direct, tax-free, qualified charitable distribution to the Sisters of the Holy Names. An added value is that donors skip the step of declaring the contribution, as they are able to exclude the amount from their gross income. This permanent provision in the Pension Protection Act has become a popular and simple way to make a greater gift to the Sisters. If you have questions about donating your IRA distribution to the Sisters of the Holy Names, please contact your development office: Sarah Harris, sharris@snjmuson.org or (503) 675-7111.